This is a very easy recipe to cook and uses only a handful of ingredients. 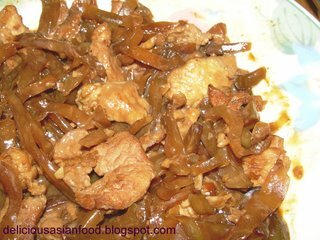 You only need pork or beef, preserved szechuan vegetables, garlic, cooking oil and dark soya sauce. The preserved szechuan vegetable, which is spicy hot and salty, gives a natural flavouring to the dish and you don’t really need to put any others seasoning apart from the dark soya sauce to give the dish some “colour”. This is my recipe for Stir-Fried Pork with Preserved Szechuan Vegetable. Heat oil in wok and add chopped garlic. Stir for 5 to 10 seconds. Add pork and preserved szechuan vegetables and stir-fry for 1 minute. Add dark soya sauce and water and cook until pork is thorougly cooked and sauce has reduced. Sprinkle some sugar if you find it too salty. Try adding black pepper, lots of them! 🙂 Love your recipes, have yet to try them but I will! Keep writing! Alex : Wow! That would really spice up the dish. Better get lots of water ready to douse the fire! LOL!